The Size Catcher Reader Question: Human Powered Digging Machines? 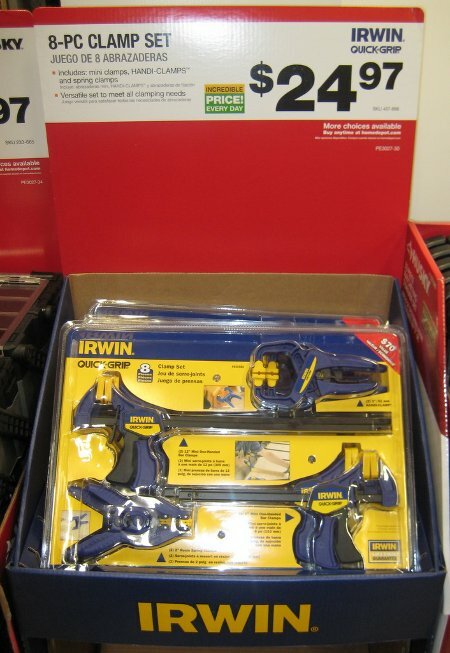 I thought I had snagged a pretty good deal a couple of days ago at Menards when I bought two 6″ Irwin Mini Quick Grip clamps for $10 after a $5 rebate. Then I stumbled upon the above display at Home Depot — an eight-piece set of clamps including: two 6″ and two 12″ inch mini clamps, two 2″ spring clamps, and two 2″ Handi-Clamps for $25 total, no rebate required. Personally, I don’t use spring clamps very often, so in my opinion they don’t add much value to the set. I also wouldn’t pay more that a few bucks a piece for the Handi-Clamps since I’ve only used mine once, but I never have enough Mini Quick Grip clamps. And four for $25 isn’t such a bad deal. I’m not sure when the deal ends, but the display was in Home Depot’s “gifts” section, so presumably they plan on selling it either until Christmas or until they run out of stock. So if you’re looking for stuff to put on your Christmas list, this set is a pretty safe bet — I know it’s going on mine. Lowe’s has a slightly different deal on these, 4 – 6″ mini quick grip clamps for $20. I would add that the clamp shown in the upper right hand corner is worthless. I have this set (bought at Menards) and it has no clamping ability at all. Sweet! I just picked up a set of these! Thanks for the heads up! A really great solution to small, low cost, spring clamps, often used in situations where more is better, is to use extra large binder clips. They’re great for everything. These are going on my wish list to Santa. Last year at one of the two big box hardware stores there was 4 – 6″ clamps for $20. I bought a set. So if you pay $5 for this it sounds like a good deal if you compare to what was available last year. Clamps are one of those things you rarely have enough when you need them. I bought a mega big 16 bag-o-clamps for $12 thinking I’d never use the 8 small ones and last month those little ones were invaluable in re-gluing a fabric chair cover. THey always seem to cost a bundle when sold separately, as though the maker knows you are shopping for one because you NEED it NOW. Then a week later you see a bundle sale … and get all steamed up over the extortion-like price you paid for one. Flab- I don’t think they are really for clamping as much as work holding or to get something out of the way. I use mine all the time when something is in the way or I need a 3rd hand for light work. I’m with Chris. There are ‘clamps’ (hold things down with pressure) and there are ‘clamps’ (holds something in place/out of the way). The spring and the handiclamps fall in the second category but are still really useful. I use spring clamps and handiclamps all the time to hold stop blocks in place on jigs.